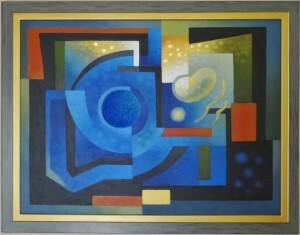 Jack Youngerman, who is known for his constructions and paintings, was born in Louisville, Kentucky in 1926. He studied art at the University of North Carolina from 1944 to 1946 under a wartime navy training program, and graduated from the University of Missouri in 1947. Between 1947 and 1956, Youngerman visited Europe, working on his art at the School of Beaux-Arts in 1947 and 1948, where his painting was influenced by constructivism. He later worked on some architectural projects in Iraq and Lebanon for French architect Michel Ecochard. There, he was impressed by the clarity of the atmosphere and the bright sunlight. He took part in several exhibitions abroad and in the United States. In New York and Paris he was involved in theater design. In 1956, he settled in New York and showed his works in 1959 at the Museum of Modern Art. Interested in optical effects, he created illusions with a series of prints based on a single geometric form. With the central figure remaining constant, he created color variations to create subtle changes in the way the object is perceived with respect to its surrounding area. As Youngerman painted over the years, his forms changed from the geometric to the more abstract, and the number of elements in his paintings were reduced in number, usually working with a few large, diagonal forms. His paint applications changed from the thick use of paint, to the smooth. His interests were in the organic form, relating to living things in general rather than to specific objects. His works often suggest the appearance of plants, flames, and leaves. His constructions and paintings may be seen at the Art Institute of Chicago, the National Museum of American Art in Washington, D.C., the Museum of Modern Art in New York City, and the Albright Museum of Art in Buffalo, New York..
For more information about Jack Youngerman and to see samples of his work visit the Parrish Art Museum, Southampton, New York website at URL: http://www.parrishart.org/Past.asp?id=68.